Fri., Feb. 9, 2018, 6 a.m.
Mayor David Condon will deliver his annual State of the City address Friday morning at an event organized by Greater Spokane Incorporated. It will be broadcast live on City Cable Channel 5 and, for the first time, the city’s Facebook page. The address begins at 11:30 a.m. at the Spokane Convention Center, 334 W. Spokane Falls Blvd. 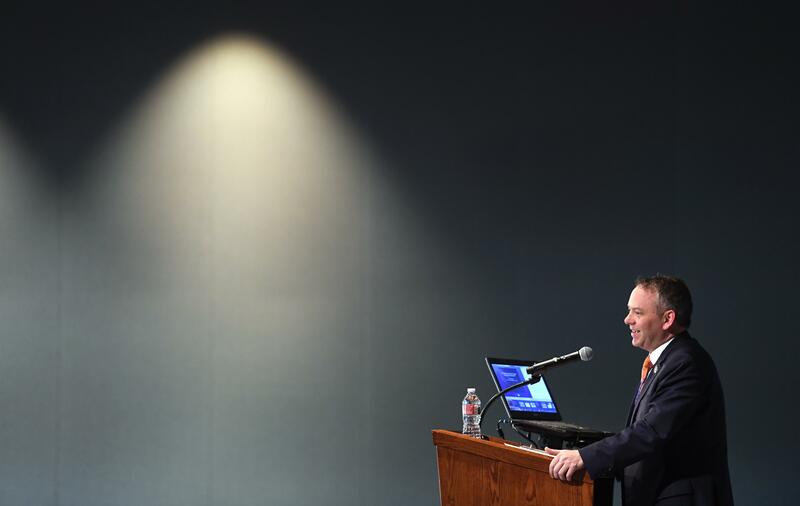 Mayor David Condon has a playbook for his last two years in office. Spokane’s first two-term mayor in more than four decades admits some of the details, spanning multiple pages of oversized paper with headings such as “urban experience” and “sustainable resources,” may not capture the imagination of the community. But the plans contained within, and the potential for catalytic public investment in the city’s core, are forming the pieces of the legacy Condon hopes to leave behind. “Sitting on that exact couch, some six years ago, was a former mayor, and he suggested to me that I latch on to a project so that you can, quote/unquote, show your grandkids what you did while you were here,” Condon said in an interview last month in his office at City Hall. He left the former officeholder unnamed. Condon, who a little more than 16 months ago faced the prospect of a recall election over his handling of the ouster of former Spokane Police Chief Frank Straub, touted a blossoming downtown, reverberating development interest around Riverfront Park and the potential for prep sports near the city center as concrete evidence of the city’s progress since he took office in 2012. But those tangible things won’t mean anything if public officials don’t embrace the city’s values in planning for them, the mayor said. The mayor said that ethic – which he dubs a healthier, safer and smarter city – has driven projects already underway, including construction of massive underground chambers to store stormwater that would otherwise stress the combined sewer system and spill into the Spokane River. It’s also the reasoning behind the city’s push to assist construction of a prep sports complex on the northern edge of Riverfront Park, which could include relocation of Joe Albi Stadium and construction of a parking garage that would also be available to parkgoers. The Spokane Park Board has signed a letter of understanding with the Spokane Public Facilities District to begin planning the project on the river’s north bank. Both the city and the district, which operates Spokane Veterans Memorial Arena and the convention center, will kick in $300,000 in initial costs to design the complex. “I don’t think there would be a thing that would make you feel better than looking into downtown Spokane and seeing Friday night lights,” Condon said. Condon said this week all the partners are finalizing the details on the sports complex’s first component: a field house for prep sports that include basketball and track and field. The mayor said he expected “all the pieces to be in motion” for the new downtown sports field house by the time he leaves office at the end of next year. That will require buy-in from several other entities, including Spokane Public Schools, Spokane County government and the Spokane City Council, which has already agreed, in principle, to set aside $5 million collected in real estate taxes toward construction on the river’s north bank. Condon entered his second-to-last year as mayor mostly out of the shadow from the Straub controversy that enveloped the first year of his second term. But in a surprise move, the issue was resparked last month when the Spokane Ethics Commission voted to revive a complaint from former City Council President Joe Shogan against Condon, accusing the mayor of dishonesty in his answers to city lawmakers about the reason for Straub’s forced resignation. In the midst of the Straub controversy, the City Council launched an independent investigation that ended with accusations of tampering and calls for resignations by City Council President Ben Stuckart. The issue died down after a judge declined to allow a recall and after Condon agreed to settle a case in September 2016 before the Spokane Ethics Commission brought by the National Organization of Women. Condon had coasted to re-election in 2015 after keeping promises to settle the Otto Zehm lawsuit against the city and lowering water rates. He also moved forward on a revised plan to improve water quality in the Spokane River. He signed off on the purchase of body cameras for police officers. And he spearheaded plans to redevelop Riverfront Park and boost street paving maintenance – both concepts that were backed by voters. But the first part of his second term didn’t produce the kinds of sweeping change that his first four years did. The blueprint for public investment, shepherded by Rick Romero, the city’s former utilities director, and recently departed Councilwoman Amber Waldref, may be what drives the city toward the big ideas that characterized his first term. It has served as a point of focus for the mayor’s office and the council, Condon said. Lawmakers have butted heads with the administration on several legislative issues and portions of this year’s budget, but Condon downplayed those disputes as routine disagreements of a divided government. “There’s fundamental things that we do disagree on, but a lot of the things that we have disagreed (about) have nothing to do with the strategic plan,” Condon said. Stuckart echoed the council’s commitment to the strategic plan, despite differences in philosophy with the mayor’s office. Dennis Hession, who was elected to the City Council, later its president and also the appointed mayor from 2005 to 2007, said city government worked best when lawmakers and the executive were working together. “When I was council president, it was my commitment that we would never do anything deliberately to undermine the work of the mayor,” Hession said. He gave $100 to Condon’s initial mayoral campaign in 2011. Hession also served as the attorney supervising the drafting of the investigative report into the Straub matter. City Councilwoman Karen Stratton has signed an affidavit calling Condon’s answers in an executive session untruthful. Condon said the matter had already been resolved by the judge overseeing the recall case against him, the investigative report and previous iterations of the ethics panel. Stratton said she stood by her affidavit. Stratton said she met with Condon prior to Christmas and again raised the issue of moving solid waste clerks from their location at the city’s Central Service Center to City Hall, a move the mayor said would increase efficiency. But Stratton, who worked as an employee at City Hall before becoming an elected official, said she was speaking on behalf of the employees who were concerned their work would suffer as a result of the move. Condon said he had confidence the ongoing cooperation with the council, which he called “quite good,” would continue through the end of next year. One that will hopefully see the beginning of construction on the sports complex, near-completion of the massive stormwater tanks under construction downtown and the opening of a new span in the University District that he’s become a defender of, despite early reservations. But the mayor is coy on what comes after. Published: Feb. 9, 2018, 6 a.m.